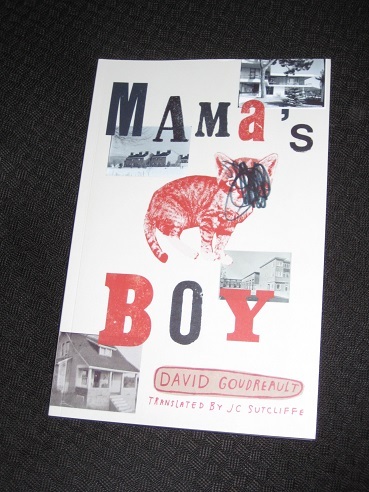 David Goudreault’s Mama’s Boy (translated by JC Sutcliffe, review copy courtesy of Book*hug) is a first-person account of the life of a young man growing up in Quebec. His childhood is punctuated by a series of moves, mostly caused by his mother’s suicide attempts, and after the pair are finally parted when he’s seven years old, he’s sent to a number of foster homes, none of which work out. Despite falling into bad habits, our friend is an optimistic soul, believing that things will somehow work out for the best. For several months, I’d been in the habit of torturing animals whenever I was frustrated. I must have been very frustrated on that particular day. The animal didn’t survive the combination of centrifugal force and my bedroom door frame. It made an odd noise, soft and dry at the same time. I have to admit that I struggled a little with Goudreault’s novel in the early stages. With the story told in the narrator’s matter-of-fact voice, relating one vile action after another, you really wonder what’s in it for you, the reader. The casual sexism and homophobia are bad enough, but when he moves on to actually committing crimes, it’s tempting to call it a day, particularly when you sense that this can only spiral into ever greater acts of violence. …for about five minutes, anyway. Once he gets out of his uniform, it’s back to staking out his mother’s house, taking enough drugs to floor an elephant and hooking up with women he met online. The longer the story goes, the more we see just how distorted his view of himself is. The image of a good-looking hard-fighting man, popular with the ladies and impressive in bed, is chipped away at, scene by scene, only kept from melting away entirely by our friend’s seemingly bomb-proof self-confidence. No matter how bad the situation, how brutal the beating, there’s always a sense that this was all just down to bad luck, and that tomorrow will see things turn his way. I abandoned this book after three chapters. What offends me is that mental illness can still be set up as justification to excuse and enable humour that is violent, sexist, homophobic and cruel. I could easily feel where the book was heading and was not interested in going along for the ride. I had even pitched a review to a journal, but pulled it when I dropped the book. Joe – If I were the type to DNF books (and I’m not, having finished every book I’ve started for over a decade! ), I wouldn’t have got much further than you. It takes a while for the idea of the narrator as loser to kick in, and then we can laugh at him, not with him. Still, there’s a lot to dislike, too, and I can understand why you didn’t feel the need to continue. I loved this. Dark and funny. But not one I could recommend widely! I will be reading the sequels I think the next one comes out soon.